Mary Grace Thibault, a fourth-year student majoring in atmospheric sciences and anthropology, is a member of the Ohio State Meteorology Club and a weather spotter, having recently renewed her training with the National Weather Service SKYWARN program. 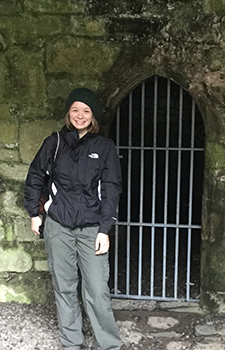 She also participated in the May 2016 education abroad program in Ireland where she was given the opportunity to take part in archaeological excavations. Last summer, Thibault participated in the Penn State REU in Climate Science and was assigned to a field work project in Key Largo, Florida, headed by Florida International University and the South Florida Water Management District. 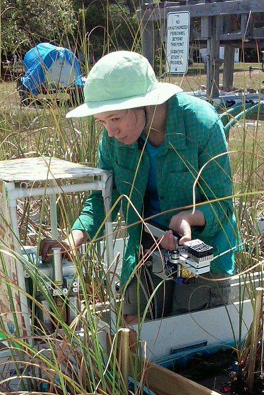 The 10-week project allowed Thibault the opportunity to observe first-hand the effects of sea level rise on the Everglades with a special focus on peat collapse and carbon sequestration. Tell us about your study abroad trip to Ireland. I took part in a May 2016 education abroad program called the History and Archaeology of Medieval Ireland: Trim and the Blackfriary. The focus of the program was on the monastic history of Ireland, and students were given the opportunity to engage in an archaeological excavation of the remains of a medieval monastery under the careful watch of the school. This program caught my attention in particular because it offered a chance to work at an active archaeological site, because the focus on monasticism was very unique, and because the location of the site would allow me to travel abroad for the first time. How was your experience abroad? The experience was incredible! The Irish landscape and the group tour down the southeastern coast through the towns of Wexford, Waterford, Lismore and Kinsale was breathtaking. The castles, waterways, museums and the 900 year old Hook Lighthouse were sights to behold. One of the most extraordinary events of the trip occurred in the seaside town of Kinsale where I met a distant relative! We also attended lectures on Irish history in parallel with our visits to these historic towns and to various historical sites including Newgrange, Knowth and the Hill of Tara among others. The program also involved a hands-on component in which the class learned basic archaeological skills at the Blackfriary Community Heritage Site in Trim, Ireland. A large field located in the town of Trim, which is about a 50 minute drive northwest of Dublin, is the location of the remains of a medieval monastery known as the Blackfriary. The original buildings comprising the monastery were torn down during the 1700s, but through excavation, archaeologists are able to reconstruct what the site would have looked like when it was in use. Students who come to the site are instructed in interpretation, excavation and surveying techniques. After one week of practice, our Ohio State group was taken to work on a cutting that had already been excavated down to the medieval layers, which was very exciting! The last two weeks were spent working on cleaning up the cutting and excavating artifacts such as stained glass, roof tiles and various metal objects. The Blackfriary is also known to have served as a burial ground, and the accompanying class project focused on this concept, pulling in the ideas of consecrated ground and folkloric stories to produce a series of podcasts discussing these themes. Overall, the program was a wonderful and unique experience, furthering an appreciation for Irish monastic history and landscape through archaeology!